It's a sad fact that the Wii U era was packed with instances where Nintendo players missed out on content in third-party games, and it would appear that history is repeating itself - with Skylanders Imaginators, at least. As we all know, the concept behind Skylanders is that toys and items from older games are backwards-compatible with newer entries, which means that those who have invested a lot of money into building their collection don't feel short-changed when they have to buy the latest instalment. Skylanders Imaginators supports character toys from all previous Skylanders games -- including Skylanders SuperChargers, Skylanders Trap Team, Skylanders SWAP Force, Skylanders Giants and Skylanders Spyro's Adventure -- that kids can enjoy in the real-world and in the virtual game world. 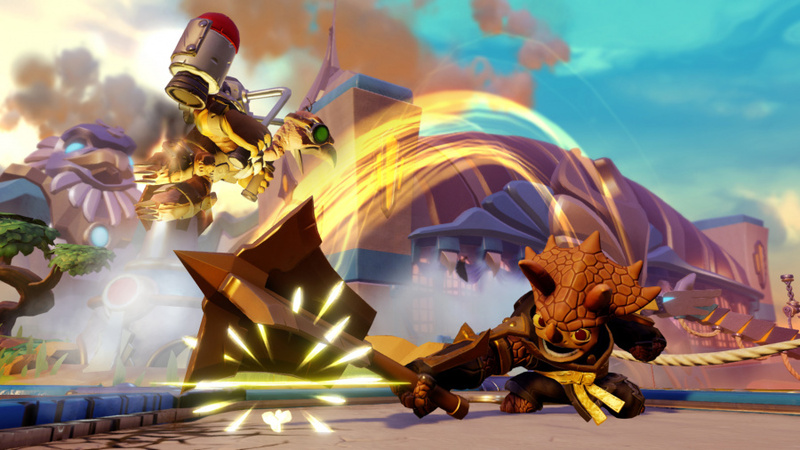 As players add new Skylanders to their collection, they expand their in-game experiences. * Excludes Traps and vehicles, which are not playable in the Nintendo Switch version of the game. Traps from Skylanders Trap Team will work in the racing portion of the game as they did in Skylanders Superchargers, with a Trap-compatible portal. Some in-game functionality may vary. All vehicles can be used in the racing mode, on all 12 tracks from Skylanders SuperChargers. What do you make of this news? Will knowing that you don't have full compatibility with previous Skylanders toys put you off purchasing the Switch version, or will you be buying it regardless? Great those skylanders toys are being rebranded finally to what they deserve. My son has been collecting Skylanders for 4 years now, we missed out on Supercharges but have Imaginators on the Wii U. This announcement isn't really that much of an issue, those figures add nothing to this game. My wife wants to know whether we can get the Imaginators game fro the Switch without buying the whole starter pack again. Switch is sounding more and more like Wii U 2.0 which is great from a 1st party perspective but terrible from a 3rd party perspective. @TbobB I doubt there is a way to get just the game without purchasing the starter pack, at least initially. I am seriously wondering what the space limitation of the game cartridge is then, as it almost feels like they couldn't fit in the complete game data and include the race tracks. In either way, this doesn't bode well if the Switch cartridge has indeed so little space and this is going to deeply affect what kind of 1st party titles we might see on this platform. I'm sure it's all something to do with it being the portable version, calm down everyone Probably the physical portal will be portable, so a bit too small to house vehicles or a compartment for traps. @EverythingAmiibo That has nothing to do With it, as since the Switch has an NFC reader, in essence you don't need a portal at all. It just smells like they had to cut down on amount of game data and remove the trap compatibility and all the race tracks. Seems strange, but I highly doubt it will be a game breaker for anyone who plans on buying the Switch and then picking up a copy of Skylanders. There are so many characters to play with, not having assess to vehicles and traps are minimal at best. WHAT!?!? What? How? Skylanders Superchargers is basically built into the game. When you get to the start screen you can choose Imaginators or the racing game. This is a 6 month old port and they are only porting half of the game?!? How can they do that!! I've worried since the reveal that Switch might get some PS3 or Vita ports of PS4 games and not the PS4 versions, go look at the DQ Heroes graphics, but to cut out a huge chunk of the game, that's just wrong. Well IF the series is dead I suppose it won't matter going forward but this sets a seriously very bad precedent. Hardly anybody on NL cares about Skylanders but keep an eye, or both, on FIFA. And every other port. Never touched any of the "toys to life" games and never will (but only if Nintendo makes one since I have 20 amiibos sitting here wanting to be used). @rjejr Exactly! 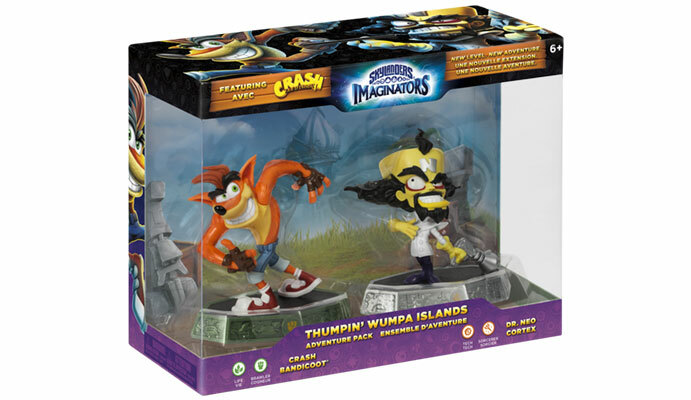 People might not care about Skylanders, but this might set a very bad precedent. So with the Switch, do we get mobile ports of the upcoming Lego games? As so far the mobile ports have been mediocre at best compared to their fullblown console counterparts. Just another example. Think about it. I find this particularly funny considering that the two Nintendo Skylanders/Amiibo come with vehicles. @Grumblevolcano how so? One dev gets lazy and its doom already!! How is it Wii U 2 when we keep getting more games announced and more features people want? Or are you just praying for it to be the second coming of Wii U? @OzHuski The point is that this is a 6 month old game. What is the reason for this halfbaked port? Because if it's technical of nature, then it is disturbing! Lol, every Switch article should have the tagline: "can't let you do that Starfox"! Its like a turd dropping on a turd (a gigantic turd-cake)! @TbobB My brother is really into Skylanders and has most of the sets for his 360. Based on what I see in our local stores, the starter pack comes out initially & then later a standalone version comes out. @rjejr I wonder if this move has anything to do with Switch limitations... or possibly just a developer choice? We've already seen a fair few games shown for the Switch that obviously expected the Switch to be much less powerful than it is (Bomberman R looks like an upscaled PS3 game). 1) They want to use the built in NFC instead of the "portal" to summon the Skylanders & this means something in the portal isn't standard to NFC readers. 2) Activision was in SUCH a rush to release a their cash-in game they didn't wait for the right size cart to be available. But I'm pretty sure Skylanders isn't that big of a game. Either way, I don't think this is a Switch tech limitation.. it's probably Toy For Bob (the devs) wanting to save a few bucks. @rjejr Thinking about it, the Trap Team portal had a separate section where you fitted the "trap crystals". If Skylanders for the Switch is using the Joycon NFC reader there would be nowhere for this to go. It's possible there is something similar for the vehicles? Might be standard NFC tech doesn't allow you to get get multiple readings at once (Skylander+vehicle). If this WAS the issue, that would make it the devs/publisher's fault for trying to make more money from the game for selling it without a portal (but likely a similar price). Can't see if the game comes with a portal, just this line from the official Nintendo page "Skylanders Imaginators makes its way to Nintendo Switch, offering players a new way to play. No Portal of Power®? No problem with Skylanders Imaginators on the Nintendo Switch as the platform introduces a digital library that allows players to easily load and store their 300+ toys from the Skylanders® franchise* directly to the new home gaming system." @Damien @NL Have you guys at NL covered the fact that the Switch Skylanders seems to be the first to let you to load up your Skylanders digitally & take them with you without the physical figures? Please see the quote at the end of my last post if not. @DanteSolablood I don't see any reason why it shouldn't be possible to have that vehicles and racing part in the Switch version. Look at the 3DS version of Skylanders SuperChargers. It comes with a portal to read in all your Skylanders and vehicles and than you can use them on the go without having to scan them again. It's a feature that has been used already and it worked just fine. @rjejr I'm feeling more confident that the rumour about FIFA on Switch being equivalent to the 360/PS3 version is true. @Tisteg80 I get what you mean, I'm just as confused about this as everyone else, as you said the 3DS version could handle vehicles, as did the 360 version, there is no tech limit preventing the use of these figures. My only thought was possibly that Superchargers/Trap Masters have non-standard NFC technology inside them. Is there any confirmation that this version comes with a Portal of Power at all? It could be done through the joycon NFC reader... making it a stupid tech demo choice. @rjejr I don't think it's so much that they can't fit the game in, it's just that Activision is making a quick cash grab with a lazy port. Superchargers performed poorly, and the Racing mode in Imaginators was just so they could squeeze some more sales on the Vehicles. But they could have just as easily added Vehicles to this one. Activision's been mismanaging this series for years now, and it looks like they just hammered one more nail into the coffin. Also, what's to stop me from going out, buying a bunch of figures, loading them into the game, and then returning them to the store? Isn't the Skylanders series dead anyway? This is pretty old news, by the way. I guess this means I'll keep my Wii U version after I get the Switch version. I want a portable Skylanders, but I also like the racing mode. I still can't understand why they just removed the racing from the Switch with no proper explanation. Why not? The games have always been backwards compatible to whatever gimmicks the previous installation brought and built into the game to recognize the old and new stuff. It's the reason we had to buy portals for new games. So just because you don't like the idea of toys to life, you automatically write it off as bad? The games are quite fun, they're charming, colorful and have a wide variety of great characters to choose from. Sorry. Please someone explain to me how - and i don't really play these games admittedly - this is an indication that third party support is lacking because of the nkn compatibility of these toys. The game is still coming. Do other console versions of this game support the toys that aren't compatible with the Wii U version? I invested a lot of money in the first game. I think I'm going to go back to this. It was fun. What the he!!. I have a lot of store credit. I'm going to get it and I don't care about vehicles. @Tempestryke Game is fine but the toys are garbage. If past toys are incompatable with the new one then whats the point. Yeah I know its only on the switch version but still. I said to myself if the switch couldnt read amiibos then I wasnt buying it, not because I love amiibos but because I would be livid to find out all of them were waste. My mistake and my apologies. I do like the figures, they're sturdy enough for kids to use them as regular toys as well. 40 comments and nobody knew? Skylanders Imaginators on the Switch scans figures via the NFC panel. It doesn't even ship with a portal, understandable for a console meant to be used as a portable 50% of the time. The drawbacks of course are the lack of traps and vehicular compatibility. Can't believe Nintendolife had no idea! I didn't read any rumour about the PS3/360 version just that it was going to be special. Coming from EA you're probably right though. Certainly won't be the PS4 version. I'd bet good money Switch version doesn't get "Story mode". The only reason the game doesn't support the vehicles or traps is because they are toys that can only be read by the skylanders portal, which is nonexistant in the switch version. The figures will be read by the NFC built into the Joy-Cons/Pro Controller. I'd imagine that it would be too much of a headache to make the NFC reader work with the Traps and Vehicles, since they're inheritely different, and honestly a miniscule part of the game, so it's understandable why they won't be making a return. This isn't as big of a deal as people who, frankly don't know about skylanders, are making it out to be. All 300+ Skylanders Figures are playable, so not having vehicles or traps isn't a big deal to a majority of players. @rjejr We had superchargers and my son rarely played the racing part. When we wanted to race we played Sonic Racing Transformed or some version of Mario Kart. Is this really that a big of a loss? @cjx324 This was my first thought too. So, another gimped port of an older game that people will use as an excuse to say no one buys third party games on Nintendo consoles when it doesn't sell as well as expected or as well as the other versions then. @SLIGEACH_EIRE This right here—to a worrying degree and in so many ways (from both the Wii and Wii U eras). @Hikingguy "Is this really that a big of a loss?" It's been my experience the past few years that when a PS3 game comes to PS4 after a few months as a port they usually ADD stuff, not take stuff away. This version will be out 6 months after all the others, so if they want people to buy it they should be adding stuff to give people a reason to buy it, not saying, "We took out 12 racetracks and the entire racing section of the game." MK8D added a better battle mode, SI took out a huge chunk of the game - the racetracks - and you can't use any of your crystals and vehicles. Why bother porting it? So 1 game isn't the problem, it's the scenario that's the problem. Wii U got several games PS4 and X1 got but w /pieces missing, usually no season pass or DLC. Switch was supposed to remedy that situation, not continue the trend of lesser versions than the other 2. That's the problem. Is this an isolated incident or how a lot of games are going to work on Switch? As I said earlier, if it's simply a free download for people on Switch, fine, it gives them something for free, but if it's a paid game it should be the whole game, not just parts. This puts people back in the mindset of - Before I buy any game on Switch I better see what's missing from the X1 and PS4 versions first. Also as I said before, will FIFA get Story mode? @2CUTE4YOU better yet, what's to stop us from taking our Switch to the store itself and just scanning the figures in without buying them? Still, this moved my purchase of this game from maybe to no. Why bother with a half baked port? I have a PS4 if I really wanted this. @DanteSolablood The game needs the portal, I don't see any way to play it with only built in NFC, too many upgrades and swapping not to keep them actively on the portal. The 3DS version didn't require the portal but it was a very limited gimped version. Leaving out the traps I dond't see as a huge deal, I don't think the new SI portal has a place for them anyway. And my best guess is they just left out the racing b/c of time constraints. Been awhile since I played it but just having the racing track separate on the main start up screen on the PS4 version makes me think it's almost it's own little code base game. Easier just not to code it than code it. I don't think it has anything to do w/ space or NFC, just time. Go read the FAQ, it looks like all races, cars and traps are available in all versions. This just makes no sense. Switch shouldn't be missing things the PS3 and Xbox 360 versions have, it's just wrong. 12. How many players can race in Skylanders Imaginators? PlayStation 4/Xbox One: Four human players can challenge four AI racers online. PlayStation 3/Xbox 360/Wii U: Two human players can challenge six AI racers online. All platforms also have local two-player split-screen racing. I'm hoping they keep the racing in, but just have all vehicles available and selectable. As long as that's the case, I don't feel this will be a gimped version at all. Having all of your Skylanders readily available without having to swap out figurines on a portal is great. I've been slowly going through these games, on Swap Force at the moment, but how much does the vehicles and traps add? I have both Trap Team and Superchargers but haven't had a chance to play them. I'm just wondering wether I should pick this up for the Wii U or Switch. I understand there's no racing mode, but was it fun? @rjejr I see exactly where you are coming from. But I think Skylanders is different from most other games. I would assume that once work is done on any Skylander game, Activision starts immediately working on the next version. Never looking back. I would assume they don't budget any time for adding features like other games might. Of course, besides the figures themselves, I don't believe any past game ever had DLC in the traditional sense. I might be wrong. What would they add besides stuff that is locked away behind the toys? Know what I mean? I would have a much bigger problem if a game like Skyrim was the basic version and not a "complete" version of some kind. I guess I was looking at it from the perspective of it is a feature from Superchargers that we rarely used. With MK8, getting a proper Battle mode was fixing a big mistake Nintendo made. In my opinion, add it back in just brings it on par with MK Wii. All the other stuff is great. Although MK8 is not my favorite kart racer either. So MK8 will not sell the Switch for me. Unless they have already announced something that I missed, I will wait and see how a game like Skyrim might be ported. It no doubt should have everything. @Hikingguy " Switches (or would it be Switchs"
Nintendo should just come out and say it's "Switch", like sheep, both singular and plural. I'm not saying they need to add stuff, but taking stuff away from a 6 month old game is wrong if they actually expect people to buy it. How many people buying a Switch won't already own 1 of the other 5 systems it's out on in it's entirety? If the older PS3 and Xbox360 versions didn' thave it and this was just a port of those well fine I guess, but all 5 versions have it. Seems like it would be easier to add it then go back to that FAQ page and write "Every version except the Switch version" 20 different times. @rjejr I know I have bought multiple version of the same game at times, but of course the first question that comes to mind is if the average consumer already owns 1 of the 5 versions, why would the average consumer buy it again on the Switch? I bet Activision knows this and is doing the least amount of work to get any return possible. They love to milk the Skylanders. And I would bet Activision probably does not care what system someone buys the game on as long as they just buy the game. Nintendo might care, but I bet Activision does not. Wasn't this series rumored to be canned shortly, anyway? @DanteSolablood "No Portal of Power®? No problem with Skylanders Imaginators on the Nintendo Switch as the platform introduces a digital library that allows players to easily load and store their 300+ toys from the Skylanders® franchise* directly to the new home gaming system." Now THAT is very interesting. Still think leaving out the cars is just a matter of effort on their part, but you've got my attention enough that I want to find out more. Wow, I can't believe they are selling it w/o the portal, it's just not the same game w/o the portal, swapping toys on and off in 2 player is half the fun. I suppose it's better, scan in all of your toys 1 time and then toss them, but that makes it a mobile game in my mind. Not 3DS portable, iOS and Android mobile. So strange. Thanks for the info. At least the graphics look good, game looks the same. Oh well, time to move on. @rjejr That's also an option as well, my other point was that I doubt it is a technical restraint of the Switch itself. I do wonder about the porting time though, it would be porting from one architecture to another & we have no idea when the decision to bring the game to Switch was. EDIT: Just checked on Amazon too.. definitely no portal. Maybe this should be in the headline too? @DanteSolablood "Probably a cash grab." Well, if it turns into a cash loss I won't be shedding a tear. No portal, no racing, still the most expensive version on Amazon. Maybe they saw how sparse the Switch day 1 game line-up was so decided this could sell just b/c people like buying games w/ their new $300 consoles. It is 77/100 on metacritic. And the portability w/o the toys would be nice if it works well that way. Oh well time to move on, again. Doesn't affect me personally but it doesn't give a good first impression. I wonder why this is? I mean they had a crossover on the vehicles with DK and Bowser and they won't work now? That looks really poor. @Damo Just to confirm that the Switch version of Skylanders Imaginators does not come with a Portal of Power, this has been confirmed with checking the box contents on Amazon. This means that the figures will likely use the Joycon NFC. If this is the case... that would make Trap Masters & Vehicle difficult on regular NFC (Trap Crystals had a specific slot on it's portal etc.). Just to re-add this from another of my posts, the same Nintendo page you looked at also states: "Skylanders Imaginators makes its way to Nintendo Switch, offering players a new way to play. No Portal of Power®? No problem with Skylanders Imaginators on the Nintendo Switch as the platform introduces a digital library that allows players to easily load and store their 300+ toys from the Skylanders® franchise* directly to the new home gaming system." Not that I play skylanders, just why did this happen? People wanting Donkey Kongs Kart in the game will be sorely disappointed. I don't think I could be bothered picking this up for $10 in a year. I want to be more positive about the Switch's 3rd party prospects, but when a company can't even bother to include functionality for a range of toys that already exist it spells something bad. I knew you would love that. @Grumblevolcano "I'm feeling more confident that the rumour about FIFA on Switch being equivalent to the 360/PS3 version is true." Uh, no. If that were the case, it would be ready for launch. It's being built from the ground up. What part of that do you not understand? I can understand your need to overreact to this news though. The editor did edge us on, unjustifiably comparing this to the Wiiu's typical third-party support. I say unjustifiably because this situation is currently with just one game, and we don't know the reasoning behind it yet. @rjejr "Certainly won't be the PS4 version." Yeah, with the Wiiu, It sucked getting the shaft from Third-parties, when I was ready to pay for a quality experience like every other console owner. Nonetheless, I wouldn't put it past thirds to deliver a proper port to a Nintendo console because I knew that there was a reason for how the Wiiu was treated, and I knew that it had nothing to do with the fact that it was a Nintendo console. Having said that, it's kind of sad to see that you guys have become so paranoid about Nintendo's third-party potential. I fear that one day some big developer is going to release a faithful port on the Switch and you guys refuse to buy only because you suspect that it will be gimped. And gimped because of the same reason that the Wiiu was gimped. I mean, why would that happen? Not only is the Switch more capable than the Wiiu, but it's a product of outsider input and therefore a lot easier to develop for. Yeah, it may not have the raw power of its console rivals, but it's coming into the market from a different angle. If you're going to suspect such a silly thing as the repeat of a crippling mistake, at least have a good reason. Oh, and by the way, the Switch already has more than one PS4 version of a multiplat in development, at least in Japan anyway. The issue is that The Switch port doesn't use a portal. It uses the NFC reader on the controller so the figures don't have to be taken everywhere (think like the 3DS games). Though I don't know fully how the vehicles are scanned in, I know for a fact that the portal has a slot that is used for traps, and there's no way the switch controller can use the traps. Whining about low sales figures incoming. Portable system or not, the game in question is homebound, so it should be treated as such and feature everything it has to offer. Its the same port situation from the WiiU all over again and what already caused these idiots to scratch their heads why their software didn't sell. @CircuitWrangler3 "I mean, why would that happen?" 1. Nintendo online set-up makes it difficult for games to offer season passes and DLC. 2. Nintendo does not like to PAY for exclusive DLC like Sony and Microsoft seem to do. 3. Standard sized 32GB cartridges don't have as much room as 50GB blu -ray discs. Maybe each of those individually isn't a good enough reason to gimp a Switch version, but looking at 2 or 3 at once, that's not paranoia, it's reality, Switch isn't the same as the other 2. I was going to wait to get this game for the Switch. But now, i think i'm going with Wii-U version. All the future Switch Skylanders games better have all the features that the other consoles have. I have a Disney Wizard Mickey (original not the clear 2.0 version) and a Spyro I bought used at GameXChange because they are awesome as figures. Later I got the Bowser and DK Amiibo figures with the vehicles you can't use. Why? Because I collect Nintendo characters. Most of the characters outside of the original Spyro are just generic looking, and it's as bad as Pokemon, gotta collect them all. Spend $50 on the game and $200 more collecting figures. @Grumblevolcano How so, the reason for this, is so the game can be played on the GO, and it will make it much more convenient to play, overall. @rjejr @StarDust4Ever I use my AC cards and Characters all the time.GIMP? The reason is so you can take the game on the road. It makes 100% sense to not use the portal. @cerenzio "It makes 100% sense to not use the portal." Have you played 2 player? Much more fun and interactive sitting around w/ 2 people and a couple of dozen toys swapping them on and off. What's the difference between toys and DLC if they are already scanned in the system and you just swap them w/ a button? Why not just buy DLC then, why even have the toys? How easy will it be to choose which 1 you want from 100 stored in the system vs the 12 or so you keep next to your portal while your playing? @cerenzio "No, it makes it Different." Well, you can think that, but I still think it makes it inferior. Why not have the portal for play when it's docked, the Joycon for on the go like the 3DS version? Why limit people? Isnt' choice better?